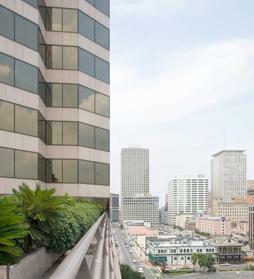 Our office business center located in the remarkable Energy Center Building on Poydras Street in New Orleans The building is a modern architectural landmark, with modern design and richly colored granite. Many offices have spectacular views of the Mississippi and other area landmarks. We are located only a few minutes drive from I -10 and The Pontchartrain Expressway, so you can get to the airport and other parts of the city with ease. For your convenience, downtown Courthouses and several restaurants and hotels are within blocks. We are also near major tourist destinations, like the French Quarter and Mississippi River Walk. Abby’s newly updated center offers full service offerings including fully-furnished offices or virtual plans, conference rooms, large flat panel television for presentations, full time receptionist, support services, and complementary Starbucks coffee. Stop by today for a tour and see why our client list is full of successful, happy clients. If you need office space in New Orleans, check us out.